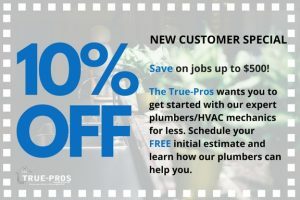 WHEN IT COMES TO PLUMBING JUST CALL THE TRUE-PROS! A Video Camera Line Inspection Can Fix Your Plumbing! In the past, plumbers had to make their best guesses on what was wrong with your home, based on the symptoms that your plumbing system was exhibiting. Today, that guesswork is a thing of the past, as the use of video camera inspections has become a valuable tool for our master technicians. Our master technicians are highly trained and professional, and can help you diagnose and fix your plumbing or HVAC problems quickly with the first use of a video camera inspection. With over 20 years of experience, our skilled technicians are trained in all of the latest tools to fix your home properly. We are so confident in the quality of our work that we back up all of our work with extended warranties, showing that we are truly dedicated to your complete satisfaction of every job, every time. With a video camera pipe inspection, you can avoid having to make important decisions based only on “educated” guesses. How Do Video Camera Inspections Work? Modern technology has allowed for the creation of video cameras that are small, waterproof, and capable of producing a high-definition image that requires little to no light. These cameras are attached to a small, flexible rod, and then pushed through your plumbing lines. The beauty of using these cameras is that it allows our technicians to see real-time images, and diagnose your issues both quickly and accurately. You can watch the inspection happen in real time as well! Call us today for a the best home service financing options!